Published: Aug. 12, 2012 at 02:37 p.m. 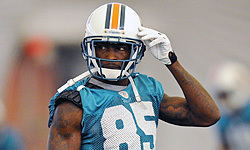 Updated: Aug. 13, 2012 at 09:09 p.m.
Miami Dolphins wide receiver Chad Johnson is out of jail following his Saturday arrest on a domestic violence charge. The police report from the incident between Johnson and his wife, Evelyn Lozada, also was released Sunday morning. Like many police reports, it tells a few different stories. Johnson and Lozada agree that the incident happened inside Johnson's "black smart" car in the driveway in front of their Davie, Fla., house. The disagreement started when Lozada "located a Walgreen's receipt in the vehicle's trunk for a box of condoms." That's where the two accounts start to differ. Lozada claims that Johnson became upset, grabbed her and head-butted her. She says Johnson yelled: "I don't give a (expletive)! I don't give a (expletive) about my career!" Lozada then walked to a neighbor's house and waited for them to come home before calling the police. Johnson's account is rather different. He claimed that Lozada head-butted him, which caused the three-inch laceration that was visible on her forehead. He also said that she yelled "(Expective) it!" Beyond the "he said, she said" version of events, the most notable part of the report is that Lozada told the police she wanted to press charges. She signed an affidavit saying so. The Dolphins are practicing Sunday, but it's unclear if Johnson will be present. Johnson was released from jail around the time practice started.